PRESQUE ISLE STATE PARK, Erie, Pa. – The road to Presque Isle park runs underneath a roller coaster. It really does. Under the coaster and the rainbow colours of the amusement park, past Sara’s Diner with its giant wiener and Betty Boop, and into the trees. 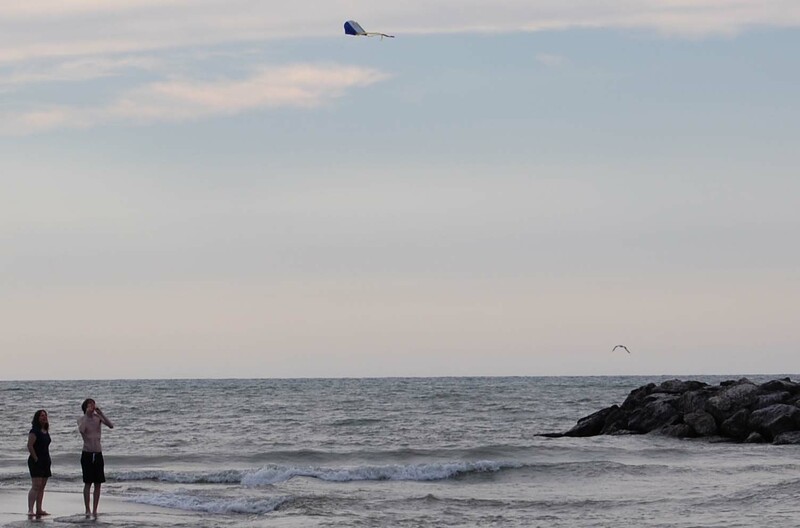 Presque Isle has been a state park since 1921, but its history goes back centuries earlier, when it was inhabited by the Eriez nation. Folklore says the aboriginal people were led by greater spirits to the peninsula to enjoy the fresh water, plentiful game and cool, healthy breezes brought south from “the land of snow and ice.” It’s a sand peninsula on Lake Erie, slowly changing geography with the years and the weather. 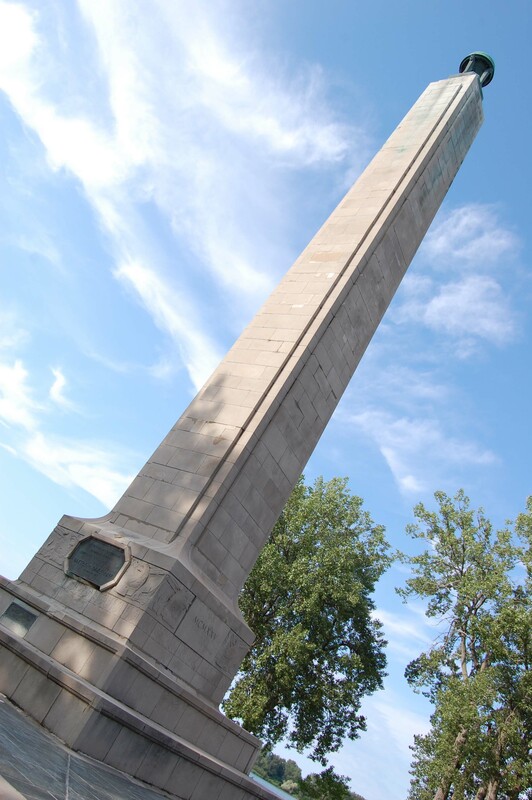 Perry Monument in Erie, Pa.
We stopped a moment to stare up at Perry Monument, to give him a nod of respect even though he tipped the balance in the Americans’ favour during the War of 1812. Commodore Oliver Hazard Perry used the shelter of Misery Bay to build a fleet of vessels he ran against the British on Sept. 10, 1813, at Put-in-Bay near Sandusky, Ohio, the Presque Isle website tells us. Returning to Erie, his men were stricken by smallpox and many were buried in nearby Graveyard Pond. His monument looks rather like you’d expect a monument to look, only taller. Every beach in the park has a small sign letting visitors know what they’ll get at that stop: fishing, boat dock, concession stand … we pulled into the kite beach and took off our shoes. There was a couple down by the lake getting set up and Trevor said wistfully that he wished we had a kite, too. After two minutes rifling through the truck’s wayback, Melani triumphantly handed him a small blue pouch with something soft inside. “A kite,” she said with a poop-eating grin. The next time I complain that we pack too much, I guarantee she will remind me of this moment. We give Presque Isle three stroller wheels (out of a possible five). It’s designed so guests can drive through the park, a lazy slow road through giant trees that make windows out onto the lake here and there. Even without a stop at the ranger station for a map, it’s easy to navigate because everything is clearly marked, offering more information than you might need. The beach was clean, the water warm (“it’s shallow,” our host explained with a shrug. Entrance is free! Pets are allowed, camping is not. There are several different types of bikes to rent, plus canoes and kayaks and your usual day-at-the-beach playthings. 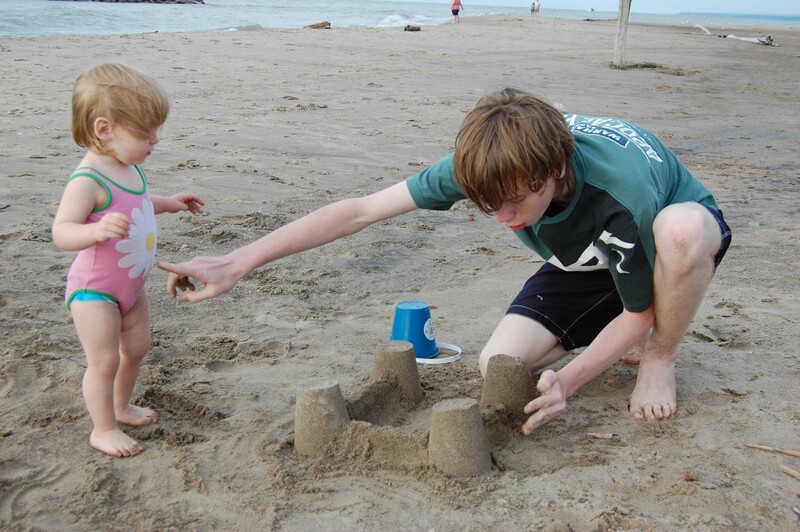 http://www.presqueisle.org. Don’t mess with my fort, child! Next Urban adventuring in Erie, Pa.
Looks like fun! Glad you’re having a great start to your holiday.